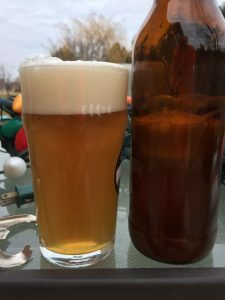 The Dude is the first NEIPA (New England India Pale Ale) that I used some reverse osmosis water. It also marks the largest number of different hops, seven, and the first time I used all 2015 hops. I don’t know if the combination of water profile and fresh(er) hops lead to a solid home brew or the combination of both. I will say, that going forward, I will be using 50% reverse osmosis water or more when making any IPA. Fresher hops also makes sense. I still have seven pounds of 2015 hops to blow through before I even think about 2016 hops. At the rate of hop usage that will be another 6 – 8 IPAs. My taste buds are waters. Time to get another recipe ready. Look:Pale gold in color. Covered by full inch of snow white foam; thin but somewhat frothy on top. Great retention, leaving behind immediate and coating lacing before even titling the glass for a sip. Good looking beer in the glass. Aroma: A light, sweet malt backbone isn’t supposed to be the center of the aroma; it isn’t. Ripe fruits abound: mango, pineapple, apricot, citrus, and pine. Taste: The taste follows the nose. Big hops and minimal sweet malt backbone. Citrus (orange) and tropical fruits foremost. Hints of grapefruit and pine. Nary much bitterness. Body: Medium body. Medium carbonation. Dry body. Used a full breath of hops in this beer. It paid. Peeking at the three week in the bottle range. Need to drink quickly. Someone has to sacrifice. Enjoy! Useless Fact: Caodaism is a Vietnamese religion that worships Joan of Arc, Shakespeare, and Muhammad. Yes, I always seem to take pictures of the hops I use. The Dude is a homage to my nine year old son. When he was born, I was on a huge Big Lebowski kick. I couldn’t get enough of the movie. Of course, it was only natural, to bypass his given name and refer to him as Lil’ Dude. I used the nickname so much that family and friends referred to him as Lil’ Dude as well. He was known more by his nickname than his real name. Now that he is nine, he doesn’t seem so little. He has graduated to just “The Dude”. I enjoy watching him grow up (as I do both of my girls). This beer is named after a fun loving kid that enjoys video games, basketball and playing with friends. Another IPA (seems like a hybrid: APA (American Pale Ale) an IPA (India Pale Ale)). There were two changes I was going to make to this beer: water and a complex hop profile. I was finally going to use the reverse osmosis system that I received for my birthday in October. My plan was simple: cut the brew day water in half, 50% tap, 50% reverse osmosis. This wasn’t a complex plan or overly thought out. It was somewhat easy. I have tried to read books and forums on water but it seems to bounce of the thick skull instead of soaking in. Therefore KISS: Keep It Simple Stupid. The second change, complex hop profile, was going to take a bit more thought. 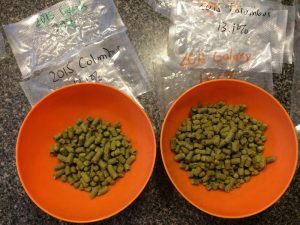 Looking up the hop profiles (again and again) helped me to understand the profiles of each hop. Past brewing days and notes also aided in choosing the hops. On hand hops played a role as well. Eureka and Equinox were definitely going to add quality subtle complexities. Galaxy, Amarillo, Columbus and Mosiac each have big characteristics that add distinct aroma and flavor. Layered the complex nature of the helps should meld well together. Enjoy! 2016-12-22: Strong fermentation at 69.8*F. Not on heat blanket. 2016-12-24: Blew off bung. Added new bung and dry hops. 2016-12-27: Put in freezer at 38*F.
2016-12-29: Bottled with 3.6 ounces of priming sugar and 2.0 cups of water. 25, 22 ounce bottles. Bottle crown label: D.
Useless Fact: US consumers spend about $5 billion a year on Christmas gifts for their pets.